For this instalment of Educating Peter, Michael has unleashed one of the, er, less useful (i.e., more useless) aspects of the music of the 1980s: the “extended mix”. 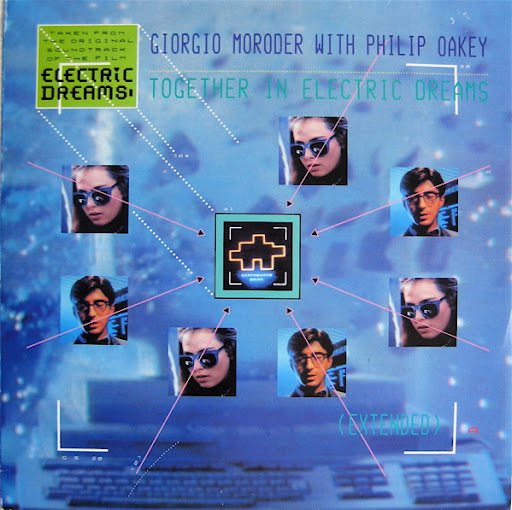 Michael has supplied me with the extended mix of “Together In Electric Dreams“, a track from the movie Electric Dreams. I don’t remember much at all about the movie (didn’t it involve a robot or something? ), but I do remember two songs associated with it: “Together In Electric Dreams” and another song (that I’ll get to later, because I much prefer it to the first one). I remember “Together In Electric Dreams” because it was a huge hit here in the land of Australians (and, I dare say, in plenty of other countries as well). But I remember the other song even more because I really liked it, and it was by far my favourite part of the movie. I’ll play it at the end of this post. Exactly why Michael chose an extra-long version of this inoffensive pop song is beyond me. I’ve now listened to it (with ghastly comments below), and I couldn’t hear anything unique or especially creative in this long version that would cause Michael to think to himself, “I must play Peter an extended mix to really highlight what the 80s were all about. I know, I’ll play him a really long version of that Electric Dreams song.” Of all the songs in the 1980s that were given the extrafication treatment – making a song much longer than it has a right to be – I’m at a loss as to why Michael decided to highlight this particular one. But back to “Together In Electric Dreams”. Shortly after that is one of the weirdest uses of echo on backing vocals I’ve ever heard. It occurs from 1:05 to 1:07, and it’s a bit of effects overkill. It also messes with my mind, because I listened to this song on headphones and the vocal echo bounced around in my head in all directions, disorienting me. It’s weird. Then there’s that ultra-familiar chord progression again. At 1:36 Phil Oakey starts singing. It’s here that I’d like to skip a paragraph, because it’d give me a chance to go straight past the part where I moan about Phil’s singing and you wouldn’t have to read my uncharitable words. But this paragraph is here, so I’m morally bound to let you know what I think of Phil Oakey’s singing. I think Phil Oakey’s singing is dreadful. I’d never noticed it before (I guess I didn’t pay much attention to Phil Oakey’s voice in the 80s), but now that I’m paying attention to it I’m hearing a dreary, dreary voice. Sorry, Phil. Can I go to the next paragraph please? OK. As the song progresses there’s not really much to report. I like the background vocals singing “Love never ends” from 2:06 to 2:10. (Incidentally, I had no idea that’s what they were singing until I looked at the lyrics.) I like how the melody of that is accompanied by some electronic sound (a synthesizer set to “glockenspiel”?) playing the same thing. Production quirk: there are two bass notes (one at 3:25 and one at 3:26) that are louder than all the other bass notes in the song. I don’t know why. Phil sings “together in electric dreeeeeeeeeams” at 3:33, and when he sings that elongated (and flat) “dreams” I know it’s the cue for the dreaded middle eight (3:36 to 4:07 – so it does make an appearance in the song). Maybe it’s not as bad as I remembered, but I’m not enjoying it. The middle eight just finished, and now it’s a horrible, horrible instrumental section involving techno beats. It sounds like someone’s gone berserk with a drum machine. Yuck. That instrumental section lasted only a minute (well, 59 seconds to be precise), but it felt much longer. And I can’t believe I listened to all of it. Although it added a few synthesizer sounds as it went along, it was still horrible. The final choruses come along at 5:07, and that lets me know that the song’s going to finish soon. (Yay!) Phil stops singing at 5:42 (thank you, Phil) and we’re left with the backing vocalists singing “Love never ends” over and over again until the song fades out. It’s very nice. And the song finishes. Unfortunately, there wasn’t any little interesting thing as the song faded out. In some songs you get to hear unusual things, but not here. Ah well. You are currently browsing the archives for the Giorgio Moroder with Philip Oakey category.